Pocket knives can be quite essential for emergency situations. But what are you gonna do with a pocket knife that's been dulled out? I for one have struggled with a dull pocket knife during an emergency, and I can say that It can be quite frustrating. Because of my unfavourable experience, I decided to get myself the best pocket knife sharpener I can find in the market. If you too are sick with your dull pocket knife, read on to find yourself a nice sharpener that will keep your pocket knife useful all the time. Which Pocket Knife Sharpener Should You Get? Whatever type of knife you own, it will surely get dull over time if you actually use it. And once it gets dull, you should really consider sharpening it to bring your knife to good use. When sharpening a knife, the outer layers of the steel or metal material gets removed to bring out a fresh layer that is sharper. You can sharpen your knife using several sharpening tools including a sharpening stone, ceramic stick, and an electric sharpener. The easiest and quickest type of knife sharpener to use is the electric sharpener. All you'll have to do is put your knife's blade against the sharpener and wait for it to be restored to its original shape. Ceramic sticks and sharpening stones, or whetstones on the other hand, might take a little longer to sharpen a knife. 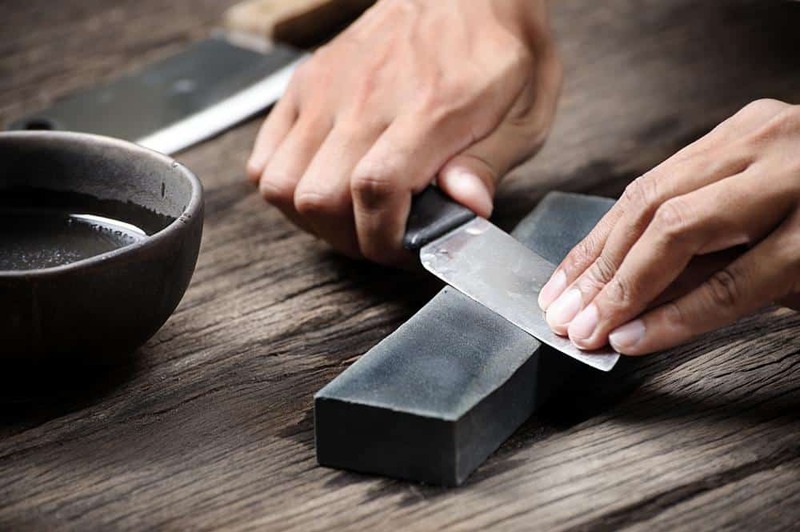 Sharpening stones would also require a form of lubrication such as water for whetstones and oil for an oil stone. You might think that sharpening a knife is easy, and that all you will have to do is rub your knife against the sharpener and you're done. Well, knife sharpening can actually take some time before getting used to. There is a proper way to sharpen a knife, and if you fail to do so, you might end up damaging your knife beyond repair. When sharpening a knife, you should always be under a bright light. You are after all handling a sharp object. 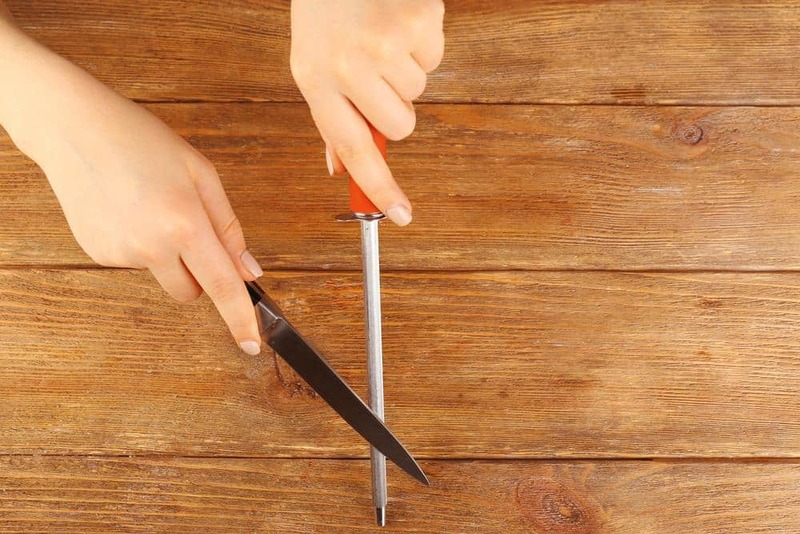 If it's your first time sharpening a knife, you may try marking the sharp edge of your knife with a marker. Doing so will help you see how much metal is being removed from your blade. The next thing you should be mindful of is your blade's angle. When sharpening a knife, you blade must be at 20 degrees. If you are sharpening a pocket knife or a hunting knife, you might want to set your knife at 25 to 30 degrees depending on its size. Once you find the right sharpening angle, you should sharpen one side of the blade with the rough grit, and rotate your knife back and forth while maintaining your angle until the new layer of metal is exposed. The number of times you will need to sharpen your knife would heavily depend on how frequent you use it. If you want to maintain your knife's sharpness, I suggest sharpening it as soon as you feel it getting dull. Another technique I recommend is that you should try sharpening your knife with a few pulls using a sharpener before you actually use it to keep it from getting dull. The Lansky BladeMedic is a great pocket knife sharpener for beginners. It features a diamond tapered rod, tungsten carbide rod, ceramic sharpening rod, and a serrated knife sharpener. What's great about this sharpener is its vee's are set at 40 degrees, making the sharpening surface 20 degrees from the center line. This means that you will no longer struggle with sharpening your knife at the right degree. The Bestiva Knife sharpener can help you sharpen your knife real quick with just a few pulls. What's great about this knife is that it perfectly sits at your hand. It has a slip-resistant design that will prevent you from getting cuts while you are sharpening your knife. What's more is that this sharpener is designed to keep your hand away from the knife's blade all throughout the sharpening process. The Three Guys whetstone knife sharpener is another reliable tool that can last for years. It's great for sharpening pocket knives, kitchen knives, chisels, plane irons, scissors, and even large hunting knives. This whetstone sharpener is made with a white corundum material that makes sure that only a small piece of metal will be take out from your blade. It also features a 600 grit side perfect for repairing rough edged knives as well as curved edged knives, and a 2000 grit side perfect for quick sharpening. The Victorinox pocket knife sharpener is definitely one that you can put in your pocket with your knife. It has a sleek design that makes it perfectly portable just like your pocket kife. This sharpener is another great tool for beginners because of its v-style pull-thru sharpener that can help you sharpen your knife without having to angle your knife's blade. Another great feature of this sharpener is that it's fairly easy to clean. It even has a drainage hole at the bottom to keep it dry when it's rinsed. This whetstone knife ﻿﻿sharpener is one that will last for years. It is made out of premium quality whetstone with a bamboo base that you can use as a handle if you wish to sharpen your knife while carrying the whetstone. 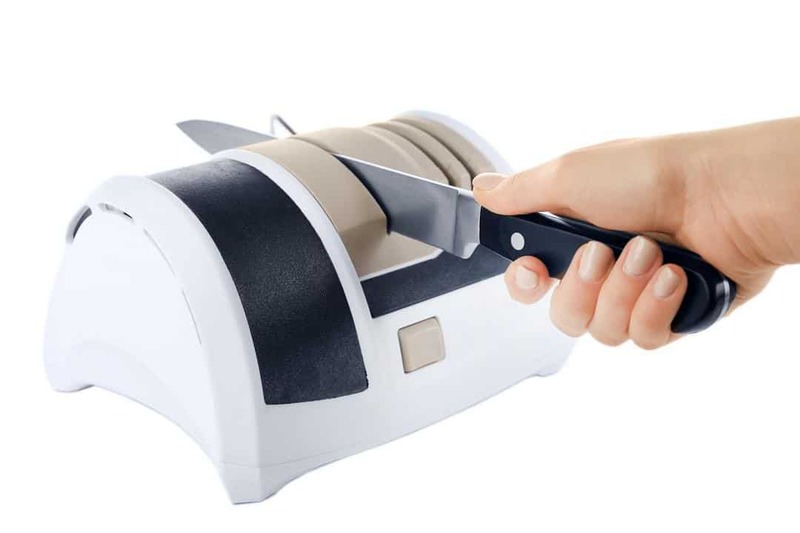 This knife sharpener may not be the best one for beginners since it doesn't have an angled sharpener, but with enough practice, you will surely be able to make your knife sharp in less than a minute. The Smith's DRET ﻿﻿diamond ﻿﻿retractable sharpener is great for sharpening serrated knives and gut hooks. This sharpener features a tapered diamond coated rod, sharpening grooves, and a half round diamond coated rod. What's great about this tool is its sleek compact design. It actually looks like an ordinary pen. You can even clip it to your pocket. However, this is not a sharpener that I would recommend for beginners since it would require you to set your knife's blade at the correct sharpening angle. This knife sharpener is built for knives of all shapes and sizes. It comes with four sharpening angles ranging from 17, 20, 25, and 30 degrees, making it a great all around compact knife sharpener. This sharpener can do wonders for you if you use several knives. Its built in ceramic polishing bench stone will surely help you restore your knife's original sharpness within seconds. Out of all the pocket knife sharpeners I have mentioned on this list, the Besiva Knife Sharpener definitely stands out because of its easy handling that makes it great for beginners, and its high quality sharpening rods that will make knife sharpening an easy feat that can be done in mere seconds. It's also pretty safe to use because of its anti-slip handle, which is why I highly recommend this reliable product.